I haven't posted in a long while, as I've been keeping very busy having fun with all my extra-curricular activities. However I wanted to post a little bit about a dog that I fostered for less than a week. She was a true sweetie and she has been adopted by an experienced dog owner in lower Manhattan. Her name is Clementine. She was a stray found in Manhattan earlier this year. Isn't she adorable? I would have kept her longer but she is an alpha, and Grover is an alpha, and let's just say I failed in keeping the two apart in the multiple dog fights they had. And I have bite marks and bruises all over to show for it. They fought... and I lost! Needless to say, Grover was relieved, as were Jake and Lucy, to have the house, and especially me, to himself again. 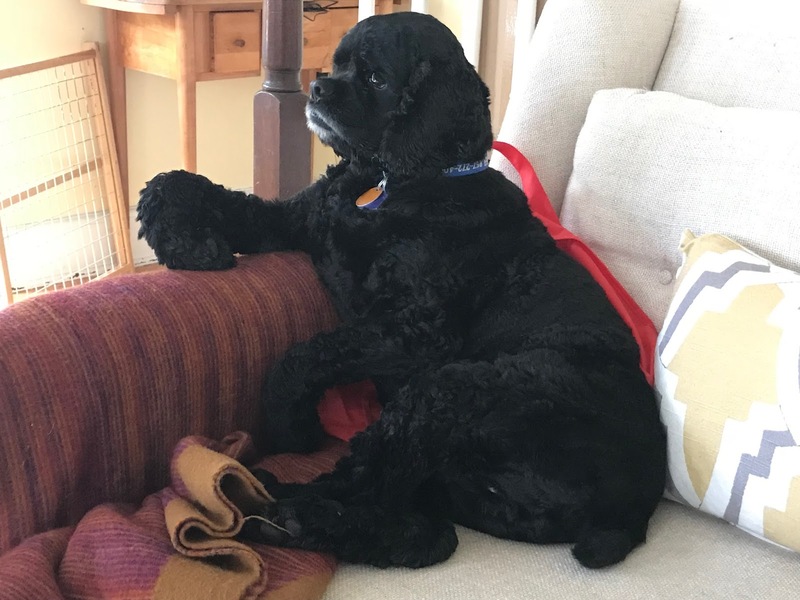 And Jake and Lucy are actually more visible now after a couple months of strange and loud dogs in the house – Grover's not such an awful brother anymore!! Through my ancestral research, I've reconnected with my mother's cousin Jane, who is my closest living connection to the Voegtly family. I'm so glad that I was able to track her down, rather randomly actually, through a letter I found when I quickly stepped into my home office to grab my slippers, since it was so chilly today. I noticed this single letter sitting on my desk amidst all the boxes and piles of paper, practically shouting at me to pick it up. I don't recall seeing this letter before, or setting it aside, but there it was. I grabbed it and brought it downstairs to continue my online research later, but a clue written on the outside of the envelope by my mother led me to wonder. It was probably an hour or two later when I found an email address for one of Jane's sons and I sent him a hopeful email. It was only minutes later that he wrote back and confirmed I had the right person. This found letter was sent to my mom in 1978 from her cousin, Jane, letting my mom know that her uncle, Jane's father, John Voegtly, Jr., had died. On the front and back of the envelope, my mother had written the key to unsolving a mystery that has stumped me for several months. It was almost as if she knew someone (maybe me) would be looking for this after her death. 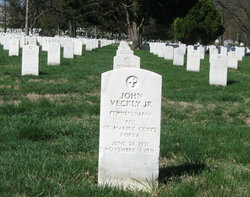 Her notes said simply "My cousin Jane – daughter of my Uncle John (VOEGTLY), mother's brother – he changed his to VECKLY. I've been searching for months for Voegtly, not Veckly, and as soon as I entered the correct spelling, it was almost scary what I could find online. And I couldn't be happier. I also found out that my mother's only other first cousin, Jane's brother, was killed in the Korean War when he was only 20 years old. He was a Marine like my dad was. And for awhile he was stationed at Camp Pendleton in Oceanside, CA, where I lived right after college, renting a room from a Marine wife whose husband was stationed in Okinawa for six months. Interesting to have that connection so many decades later. When we were kids my family went to visit Arlington Cemetery and I wonder now if we looked for his tombstone. I found the details of his service and a copy of his tombstone that I wanted to share. Private First Class Veckly was a member of Company D, 2nd Battalion, 1st Marines, 1st Marine Division. He was Killed in Action while fighting the enemy in Korea on November 1, 1951 and posthumously received the National Defense Service Medal, the Korean Presidential Unit Citation and the Republic of Korea War Service Medal. 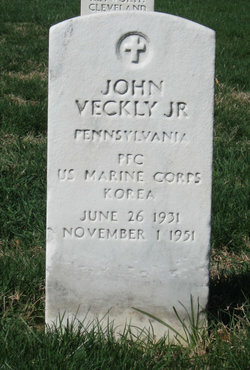 "Jack" Veckly was stationed at Parris Island, then Camp Pendleton, and traveled to Korea in the Summer of 1951. In the interest of posting more regularly, I have about 30 saved drafts, some years old, that I am sifting through. For the ones that are slightly still relevant, I will post them despite not being current. This is one of them. I've been picking through various papers, photos, and scrapbooks that my family has saved over the years, including all these wonderful images and clippings from my ancestors. However it's the computer files that are the most sobering, and not surprisingly, emotional, for me to review. I am tentative about opening files on my dad's computer, feeling a little bit like I'm snooping and not quite sure I want to read everything, since, after all – they are personal! But what does one do when someone dies and leaves an extensive library of work, either electronically or print? Collectively, my brothers and I are all reviewing the contents of my parent's house, including papers saved in various places in the house. I copied the contents of their computer after my dad died, pulling all his genealogy and whaling research files, letters to the editors, his lists, and his memoirs. I know some families where they throw everything in the trash, rather than take the time, or effort, to review all that is there. I could never do that. I want to least see what they have been keeping all these years, hoping to find a little more insight into their lives and what as people, not parents, they felt was important at the time. Looking through the computer files goes a step further; I'm learning more about my parent's daily interactions with people through the various organizations with which they were involved. They are numerous. 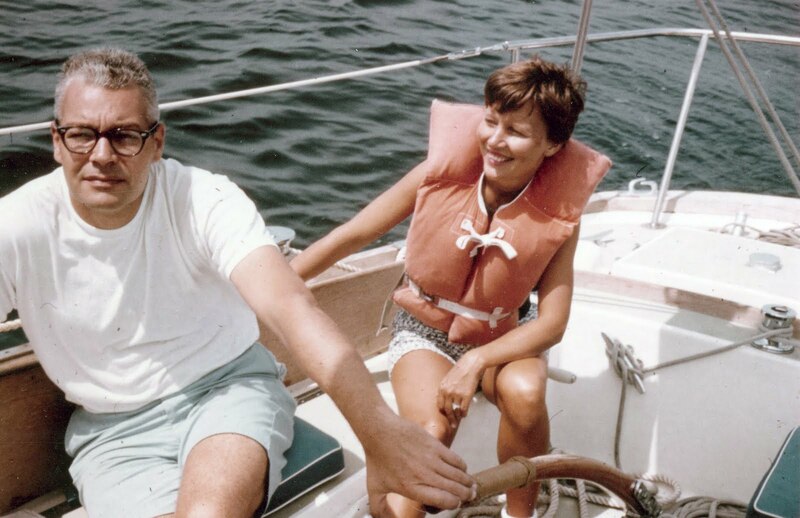 Did I mention that my father LOVED sailing and that my mother was TERRIFIED of water? I didn't know this until I was much older and I'm glad I never realized it when we were little. In a Christmas letter to his friends one year my dad referred to my mother as Chicken-of-the-Sea. Nice, huh? We would spend three weeks every summer on a 35 foot sailboat; it was much like camping, only on water. Whether we were living on the coast in Connecticut or in land-locked Ohio, we always had the Willy Wispe to sail the oceans and lakes. Thinking back, knowing how much my mom hated sailing, I'm sure she was quite relieved when we stopped sailing in the Atlantic. I'll share some sailing stories with you in future posts, including our "Children's Logs". 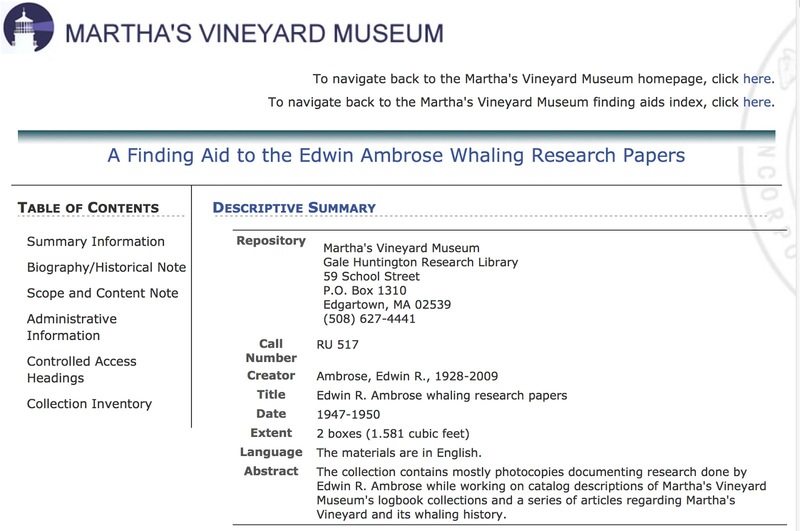 Among the documents my father had on his computer, I found this poem tucked into a folder with his whaling research. I somehow think it must've hit home for him when he read it. Maybe that's why he saved it. It's days like this when I start with 2 big cups of coffee laced with espresso. Luckily, since my schedule is flexible, on days I head to Boston I leave the house around 5:30-6 and get into the office between 6:30-7. Which gives me a solid couple of hours to gather my thoughts before the rush is on and before my bluetooth headset gets permanently glued to my head. Today, though, a rarity will occur. An in-person meeting with an outside vendor. One of many design launch meetings today for a product my company is working on. Usually, everyone is on the phone in multiple locations too many to list here (it would bore you). But today, a handful of people whom I haven't met or haven't seen in years will be here in person. A nice change of pace, and an opportunity to catch up with old friends. However, as you can see from my schedule, a day like this is a little like Sophie's Choice. 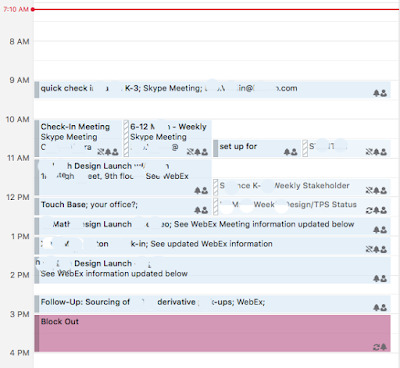 When you have 4 meetings at the same time, which do you pick? Do you show up late and leave early? To every meeting? With most of my team out of the office this week, it's not like I can send a proxy. So I guess at least I will need to go to the meetings I've scheduled, since people would probably expect me there. Sigh. This does make me wish it was a Friday instead of a Thursday. But I'll close my eyes and before you know it, it will be. Maybe I'll call and schedule a massage. 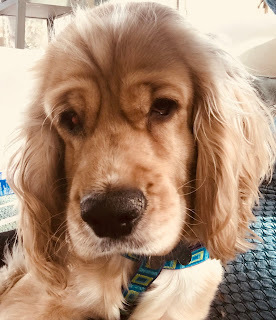 I've been wanting my own dog since I graduated from college, but I never thought it was fair to the dog when I worked full-time and spent 2-4 hours in the car commuting every day to work. Now that I'm lucky enough to work from home a lot, I made the decision that it was time to get a dog. 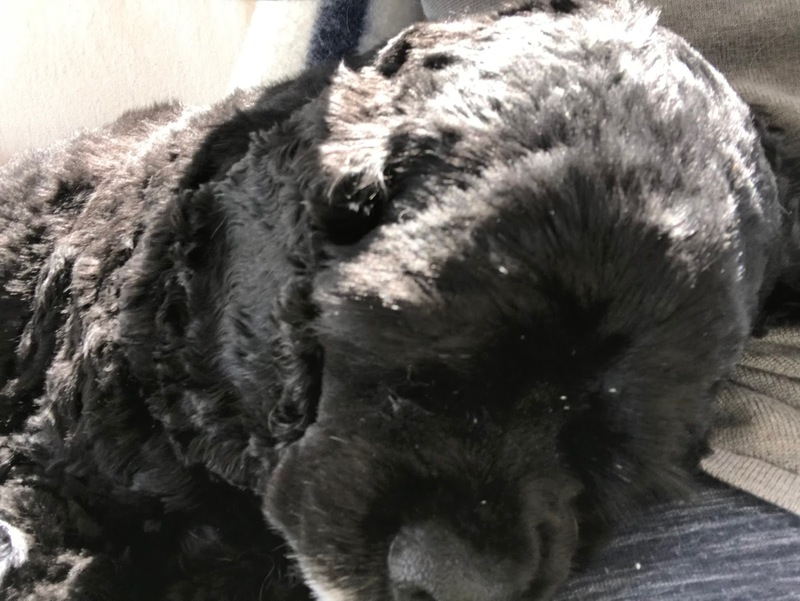 I wanted a cocker because we had them growing up, and I also like their temperament and size. I also thought a dog would be a lot easier than a puppy. Start with a dog and if I don't kill him, maybe I'll get a puppy next time! 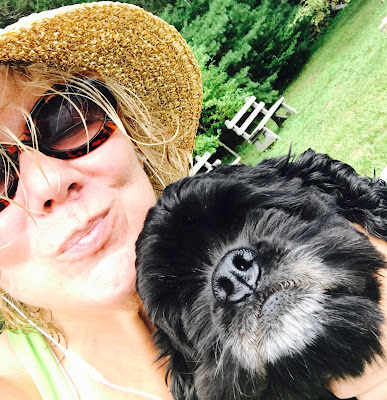 When I contacted AACSR, they set me up with an in-home visit for approval and then had me assigned to Jennifer to help find me the perfect dog. Though my requirements were quite simple but seemingly impossible to find (aka a dog with no problems whatsoever) it didn't take her long to find Grover. On paper he seemed perfect. Grover was found as a stray in December 2016, matted and flea-infested, and very skinny (he's gained over 10 pounds since then!). 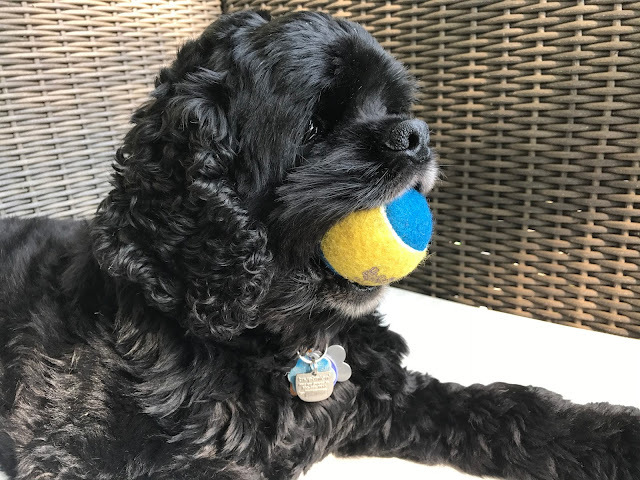 I don't know much about him, other than he's trained in the basics, especially well house-trained, and is sweet and happy and grateful at every turn. 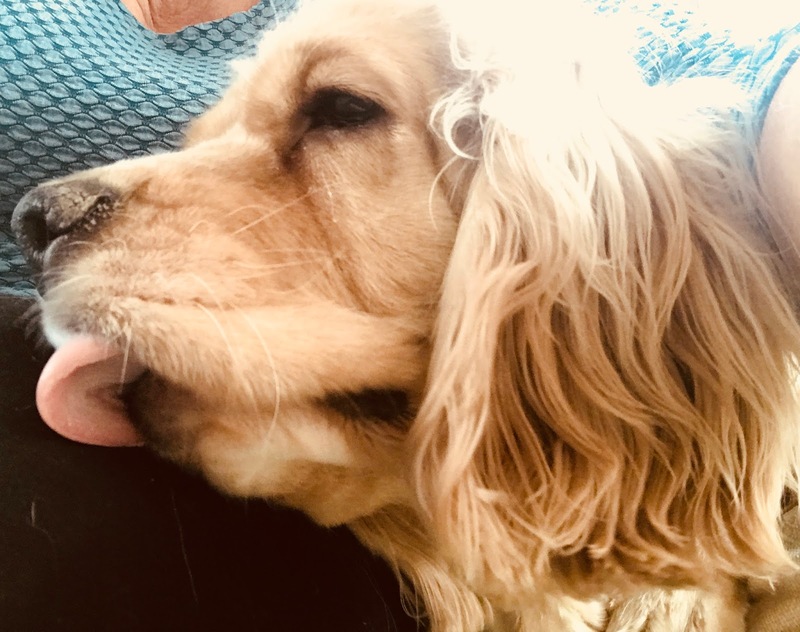 He especially loves people, more than dogs, and especially more than cats – which is a bit of a problem at home. And he loves going on walks. Grover on the day we met, waiting to go to his new home. After eye surgery, in healing mode. The only known health issue at the time was his cherry eye, aka nictitans gland prolapse, or prolapse of the gland of the third eyelid. I believe all dogs have third eyelids, where a tear gland is located. The rescue league was going to fix the eyes before I adopted him but I didn't agree with their vet's solution to the problem, so I took him home and found a specialist who could do the delicate surgery at my own cost (ka-ching! ka-ching!). Days prior to his surgery though, Grover suffered a grand mal seizure or a fainting (scary as all hell to witness) and off to the emergency clinic we went. He was hospitalized overnight for observation. 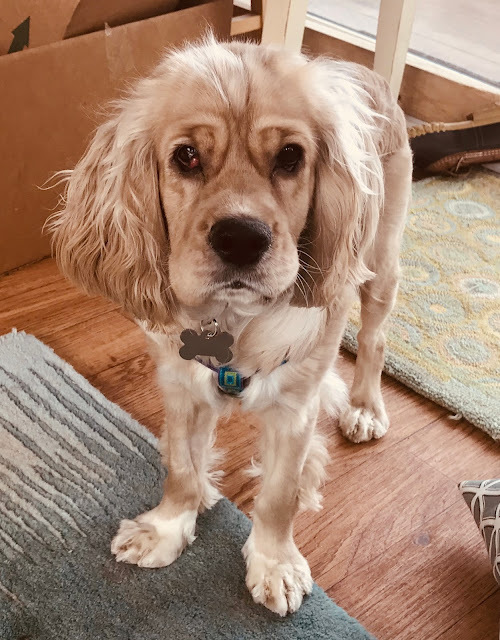 This delayed his eye surgery a bit, but with a little time and luck and no more seizures, in a month he had his surgery and his eyes were on the mend. Doesn't Grover look handsome with his new eyes? Just don't ask him to smile! Fast forward to August, wherein I decided to groom him myself with a new pair of dog trimmers. Save a little money? Bond with Grover? I thought I did an okay job, although admittedly I got a little close on his neck and it was a little pink, but I didn't think overly so. This was last Sunday. He was fine for a few days until he developed a hot spot under his chin, about the size of a deck of cards, and hard as a rock. I immediately took him to the vet, where he was given antibiotics, and I, no judgment. After grooming and a warm bath and coconut oil moisturizer. Scab rolling over onto itself, oozing top and bottom. Sunday, on the way home from emergency care with the dreaded cone. Despite the antibiotics, Grover managed to scratch his way to a new sore, above the scab, and he also started to hide from me. So off we go to the emergency clinic again. Over three hours later he appeared with the scab removed, a fresh, but sore-looking neck, a cone, and another prescription for steroids/antihistamines to accompany the antibiotics already prescribed. As we settled back into our day at home, Grover whining in pain, he had a mild seizure. Sigh. A day later I knew he was feeling a little bit better since he started growling at Jake (his feline arch nemesis). With some luck and training, Grover does not go upstairs anymore. The cats eat and do all their business upstairs, while Grover enjoys the downstairs and the outside. Lucy, Jake's timid sister, hasn't stepped onto the first floor more than a couple of times since March. I'm really hoping this improves over time. However, probably because Grover's not feeling well, he has decided he doesn't want to sleep alone and he barks, whines, and then howls until I come downstairs and sleep with him on the couch – which I've done for the last two nights. It's a little tough when you have to get up at 5am for work, but since this is ALL MY FAULT, how can I not? So, why am I documenting this when I have so many other things to post? I want to remember all this when I think of getting my NEXT dog. Grover's been great and I wouldn't change a thing, but it is a commitment for sure, both in time and money. Thank goodness I'm not having to pay for college! It's been so long since I've posted anything it feels foreign to me to write in this space. I'd like to be able to get back to writing again and sharing with you some recent stories and whatever is on my mind. I'm going to try and avoid talking about the events of November 8. 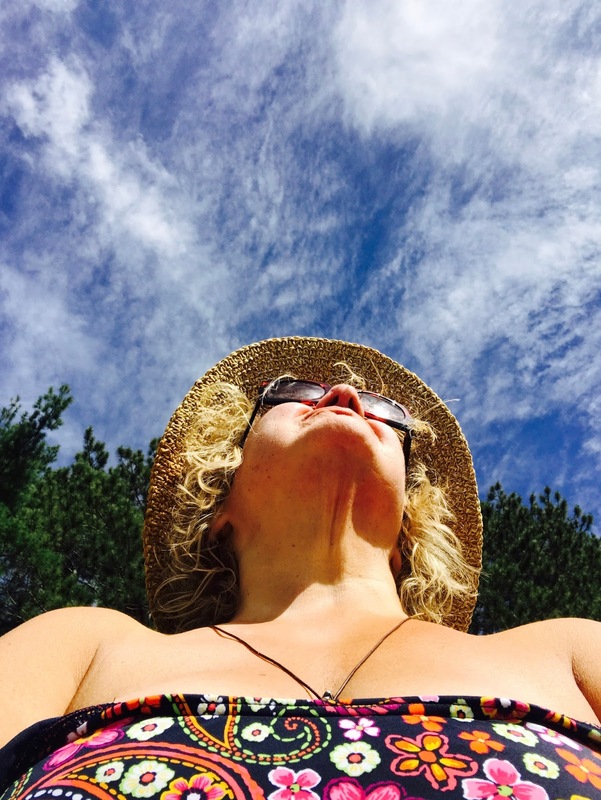 As my birthday fell on the following day – it was a sad day – and one to remember for sure. That's all I'll say about that. I'll post a few photos to start. This happens usually around dinnertime or bedtime. I'll let you guess who wants what. 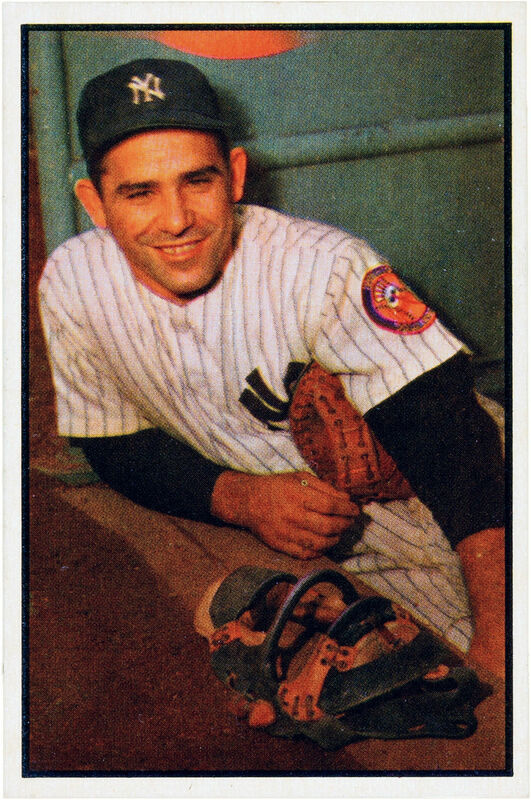 about the death of Yogi Berra. when we lived on Miles. my name would be Sarah Berra." I recently made a trip to Chicago for business purposes. Since one quarter of my family tree stems from Chicago, I decided to take a little vacation before and after the work part of the trip to focus on genealogy research. 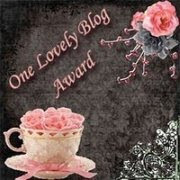 Stay tuned for more postings on this blog, with some of my newest discoveries. It's very exciting! This particular photo, however, has no relation to my family. 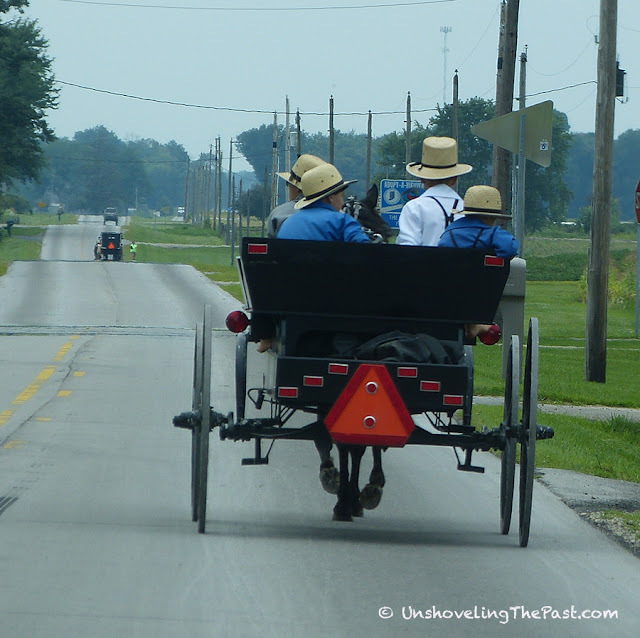 I was driving in Indiana and I came across an Amish settlement and was captivated. I'd only read about the Amish, or seen them in movies or, at worst, referred to in several reality television shows. But after driving around for several miles swerving in and out of dozens of buggies, all I wanted to do was read/know about them more. I devoured the PBS series on my iPad in the evenings on my trip, along with other documentaries, blogs, and Lifetime movies – till I was fully satiated. Though it's a complicated religion, I do admire their intent to simplify. One of the themes of my business trip was essentialism, and in retrospect, my extra-curricular study of the Amish fit in most appropriately. 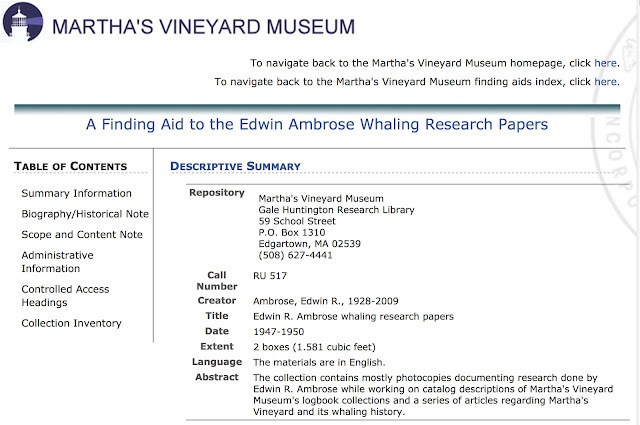 My dad would be tickled that you can google his name and up comes a link to his unpublished research on whaling. Here he leaves the legacy of his passion, even if his work was unfinished. Random clipping from my parent's files. 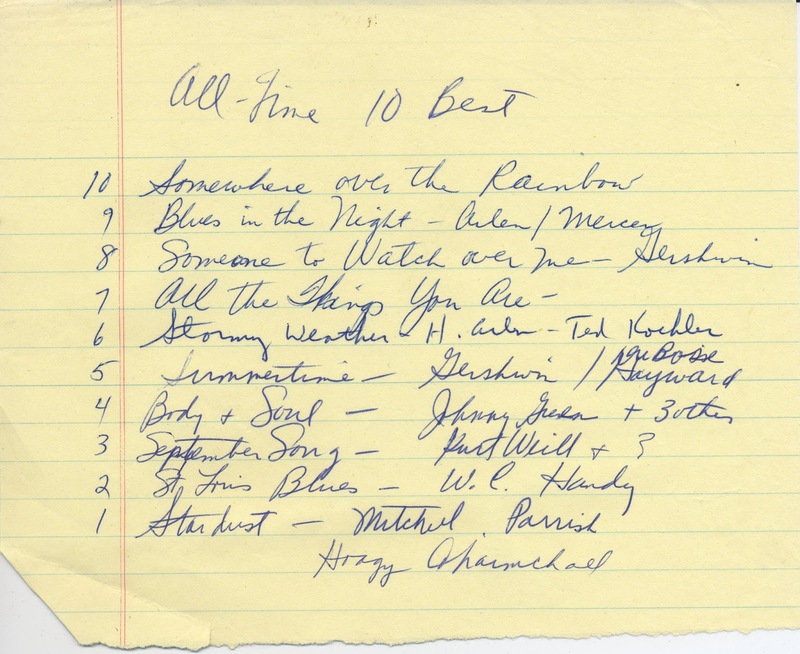 Most is in my mother's handwriting, but I see dad's there too. Oh No, It's Almost Summer! ©UnshovelingThePast.blogspot.com. Non-commercial use of content granted w/credit & source citation. Picture Window theme. Theme images by dfli. Powered by Blogger.